A roof extension is a big job as it will involve scaffolding and disruption throughout the house. But the advantage, adding a bedroom and perhaps another bathroom too, makes the disruption well worthwhile. A loft conversion is one of the most cost-effective building projects you can do, particular if you can do it within the existing roof space. This means you don't have to apply for planning permission. But if there isn’t the space you'll need to do a roof extension first, to increase headroom, then do the loft conversion. You can extend the roof by adding dormer windows or pushing one of the pitched sides out along the length of the roof, a bit like a very long dormer, with one or more windows in the vertical wall that you end up with. There is also the hip roof extension. This is where the original roof slopes toward the end of the house as well as to the front and back. This kind of roof can be extended by pushing the original ridge line out to the end and putting a window in the new gable. Whichever way you extend the roof, once it's done you can then get on with the internal work, creating the loft conversion. Although a loft conversion may not need planning permission, depending on the rules in your area, a roof extension always will. The main issues surrounding the application will be the look of the dormer or extension, whether or not it will overlook other properties, and fire safety. Most planners will not look kindly on roof extension plans that are out of keeping with the area and the property or don't match other dormers and extensions in the street. 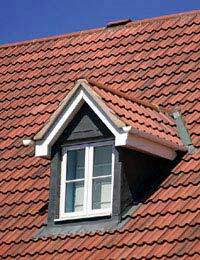 If other properties in the street already have dormer windows on the front then that increases your chances of getting them too. Roof Extension to the Front or Back? Many planning authorities will not allow dormers or roof extensions on the front of the house, facing the street, so your chances may be better off if they are at the rear. You can probably put rooflights at the front if you need the extra light. But having the roof extension at the back means the windows may overlook other people's gardens or houses, which is the second possible objection. You many have to install obscured glass windows or agree to erect fences or plants to restore neighbours' privacy. Fire safety is a complex area and will be looked at very closely when the building regulations inspector deals with the loft conversion. But when applying for planning permission for the roof extension you might need to explain the provisions you are making for escape. This may include an escape window that will allow people to get onto the roof, from where they can be rescued by ladder. It's worth pursuing the planning application again if you are knocked back. If you can get it through it will be a major bonus for you and should increase the value of the property as well. We are buying a house that was once 2 cottages made into 1 property the owners just knocked a hole downstairs and put a door in to join the 2 properties downstairs but upstairs it still remains the same you cannot access all the bedrooms from either staircase so it still has the same footprint upstairs. We want to change that and access all the bedrooms from one staircase the front staircase, the problem is it is a cottage built in 3 eras 1920 1780 and extension 1980, the 1780 section in the middle has an oak A frame and the architect we had briefly round said it would be hard to just smash a whole in the wall and make the bedrooms smaller and create a corridor to get to the bedrooms it is a long narrow house, and we feel it would alienate a lot of buyers if we keep it as it is if we wanted to sell at a later stage. The property requires a full theme of renovation heating plumbing electrics maybe new roof etc. Can you suggest anything. Sorry without details of the building's layouts it's very difficult to comment. It's likely that you might have to re-design the entire upstairs to allow for a door in the middle of theA frame. A good architect would normally give you a few different options so it might be worth looking for someone else with experience in design of this kind. We are buying a house that was once 2 cottages made into 1 property the owners just knocked a hole downstairs and put a door in to join the 2 properties downstairs but upstairs it still remains the same you cannot access all the bedrooms from either staircase so it still has the same footprint upstairs.We want to change that and access all the bedrooms from one staircase the front staircase,the problem is it is a cottage built in 3 eras 1920 1780 and extension 1980,the 1780 section in the middle has an oak A frame and the architect we had briefly round said it would be hard to just smash a whole in the wall and make the bedrooms smaller and create a corridor to get to the bedrooms it is a long narrow house, and we feel it would alienate a lot of buyers if we keep it as it is if we wanted to sell at a later stage.The property requires a full theme of renovation heating plumbing electrics maybe new roof etc.Can you suggest anything.